Flase lashes are a girls best friend. Let's face it, if I can't be swathed in diamonds then my next choice would undoubtedly be my beloved collection of false lashes. Whether I'm glammed out or just going for a quick coffee date, I've found that adding a little extra something polishes off my entire look. 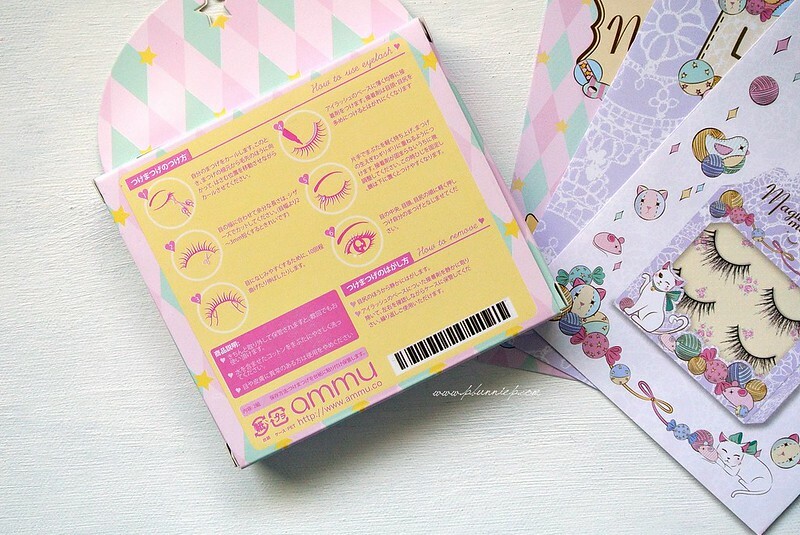 Today's product is something I've been drooling over for many months since seeing them on a few Asian beauty blogs but never thought I would ever get hold of them...until now. 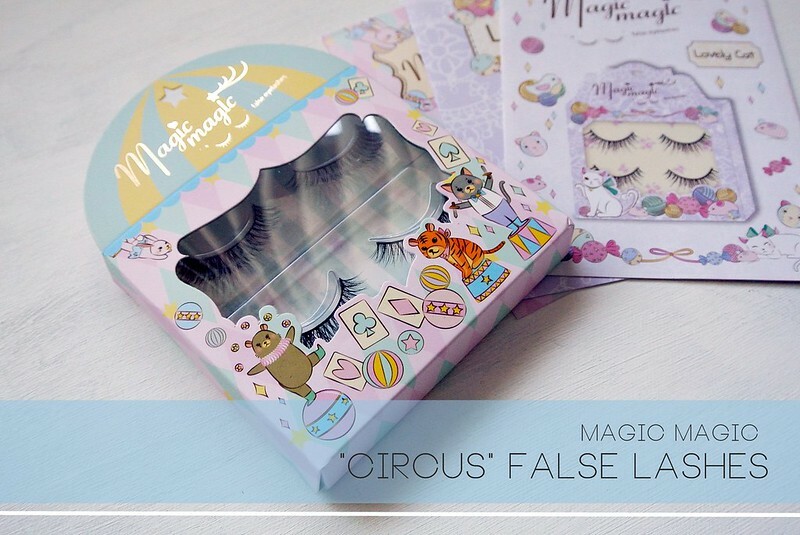 Adorably boxed in it's circus themed pastel box, this series of false lashes is the premium line created by Magic Magic. 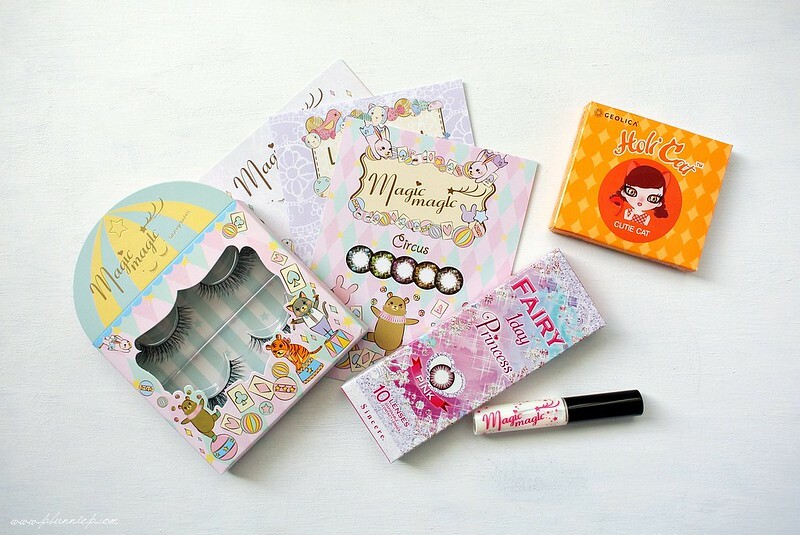 Each package comes with two pairs of lashes carefully presented in their own display box. 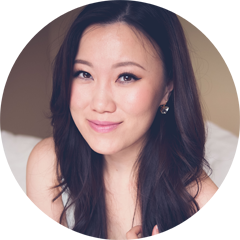 Not only is this line adored by bloggers but models from some of my favourite Japanese magazines have been known to use them as well for that impeccable lush lash look. A closer look at the lashes shows that these are, what I like to call, "hard backbone" designs meaning that the lash hairs are attached to a thin strip of firm plastic given them more manageability and sturdiness. The lash hairs themselves are quite long and have a soft curve to them. Criss crossed at the base to give a more voluminous look, this design has a full but fluttery look that gives the eyes a more feminine appearance. The blend of natural mink and horse hair look soft and believable when worn but does feel firmer to the touch and keeps it's shape very well though multiple uses. Below I am wearing the entire strip without trimming the length and you can see how the Circus series is very long, spanning from the inner tip of my eye and just slightly beyond the outer edge. Unless you naturally have a large or elongated eye shape, I definitely recommend trimming theses down (trim from the longer side) for a more comfortable fit otherwise the hard backbone can tend to poke into your inner eyelid. 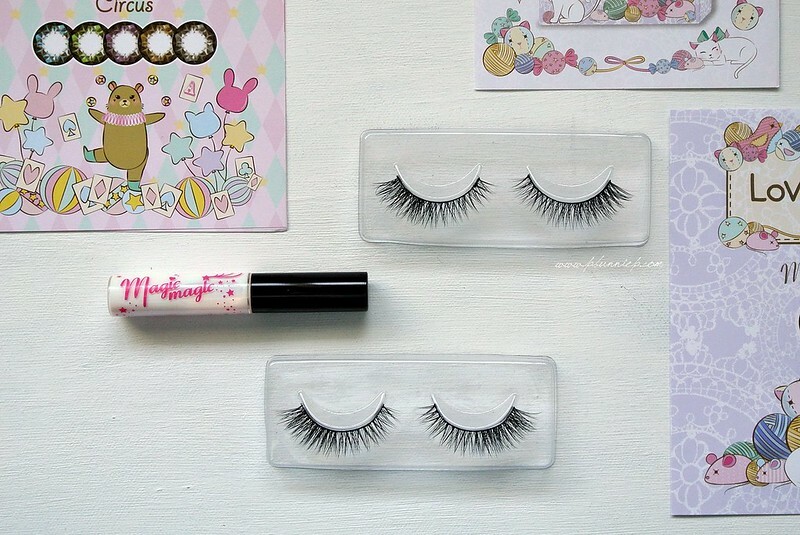 When paired with makeup, I found the effect of these lashes very comparable to my most worn Dollywink "Sweet Cat" lashes, with these being slightly more voluminous at the base. While I did not wear liquid eyeliner over the lash line to cover the base of these lashes, they still looked quite natural altogether. 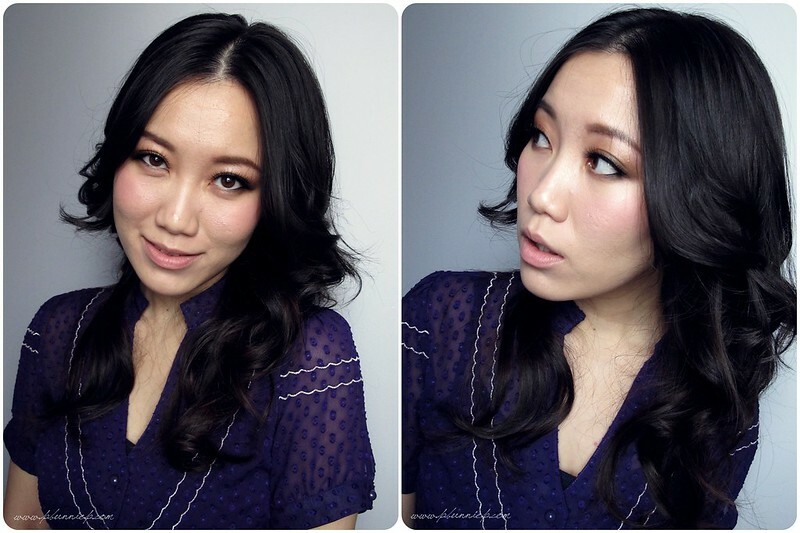 Extremely photogenic, this style is what I prefer for a defined and polished makeup look for dates or filming videos as well. 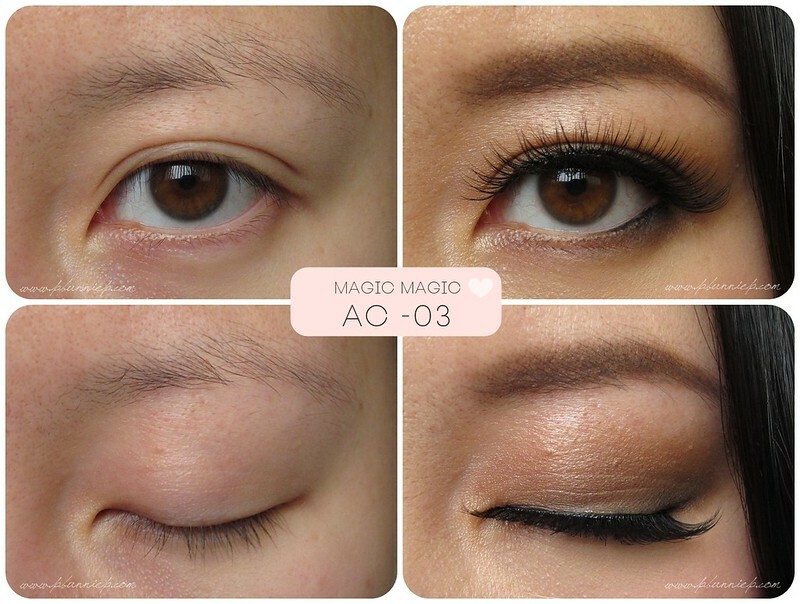 Along with the false lashes, I also had the chance to try the corresponding Magic Magic lash glue which comes in both black and transparent variations (mine is the transparent). The slim tube features a pointed brush tip for easy and precise application. Marketed as being extremely strong and long lasting, I was surprised to find this formulation very thin and liquid compared to my usual latex based DUO lash adhesive. Thankfully, unlike the DUO I didn't detect any strong odors from the glue. While I did find this glue to be very strong indeed, the thin consistency and extra long drying time did not pair well with hard back bone lashes like the Magic Magic Circus series. 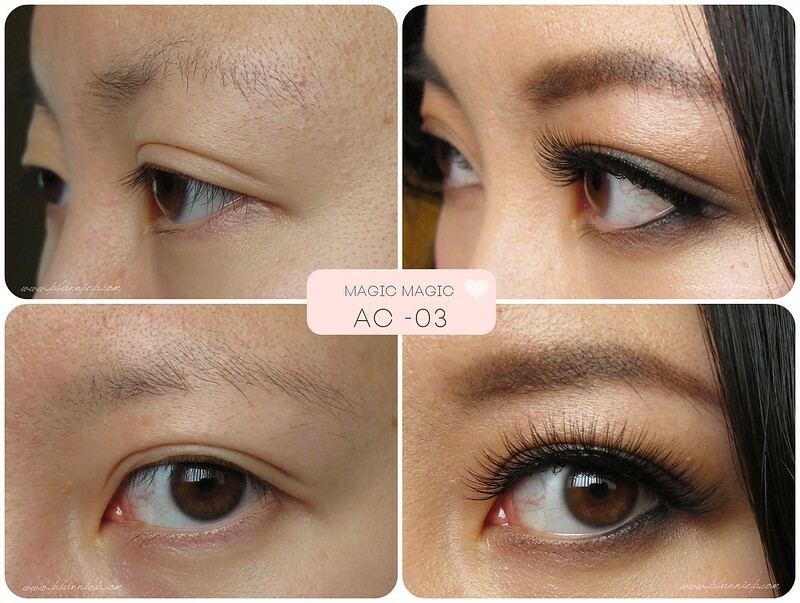 I felt there wasn't enough thickness or "tackiness" to the product to hold these types of lashes in place but on the other hand would work much better with "invisible bands" lashes. Once it finally sets however, it does hold firm and I even had quite a time trying to wash off the swatch from the back of my hand! 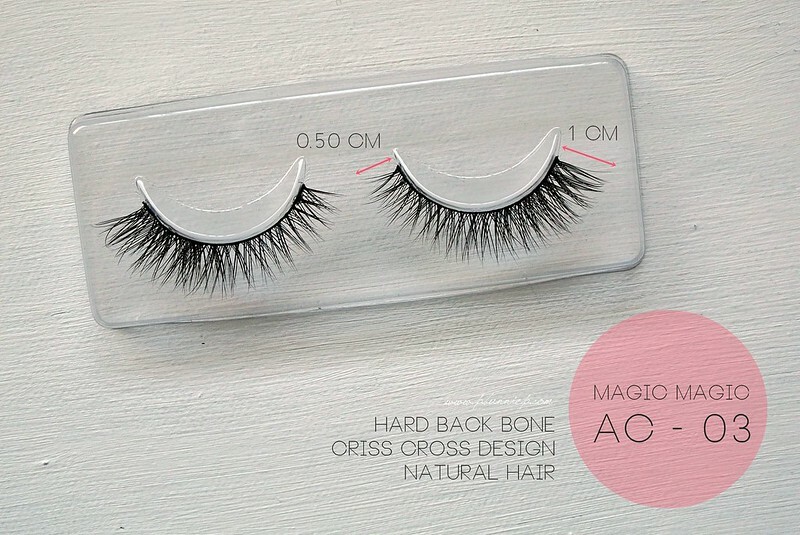 For the design, durability and the pretty effect this gives, I think these Magic Magic Lashes are well worth your money. If you are used to wearing "invisible band" lashes then these will not be as comfortable but if you have monolids especially then these plastic backbone lashes will be a much better option as the firmer base will prevent the lashes from being pushed down and drooping. While I have yet to compare them side by side, the touch and feel of the Circus series is almost identical to the much more expensive mink Velour Lashes. 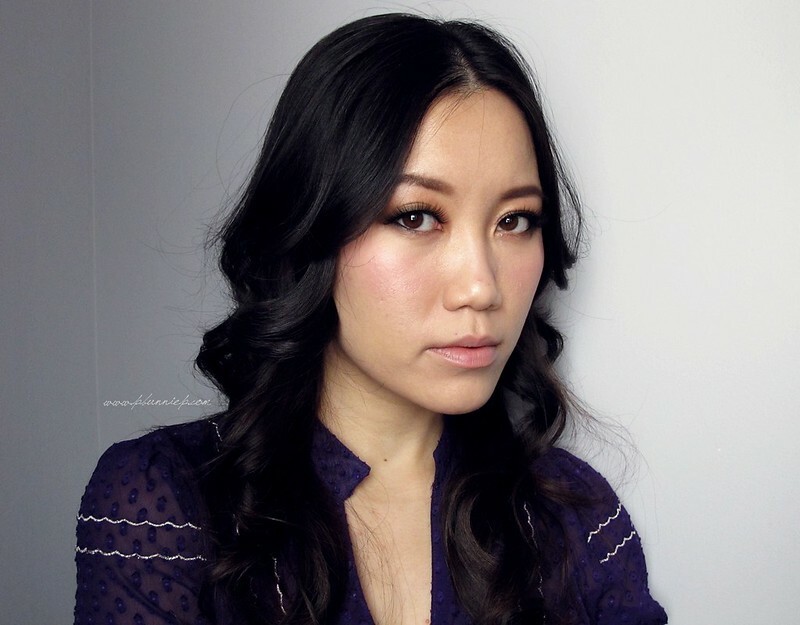 The Dollywink "Sweet Cat" is more comfortable to wear for long periods of time and does not require any trimming for my eye shape and the type of makeup I wear on a daily basis. However these come in at a very close second place, the effect is quite similar and these are something I would recommend (over the Dollywink) if you're weary of handling very delicate lashes or if needing more lift either with hooded eyes or monolids. 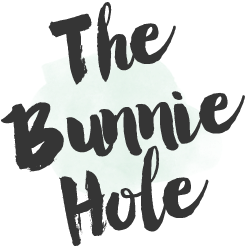 If you're looking for an easy way to enhance your everyday makeup look, I have already reviewed the Fairy 1 Day Princess lense which gives just a tint of colour to your eyes and will pair beautifully with these lashes for a polished feminine makeup look. More to come, I'll also be reviewing the more dramatic and fun Holi Cat lenses so stay tuned! 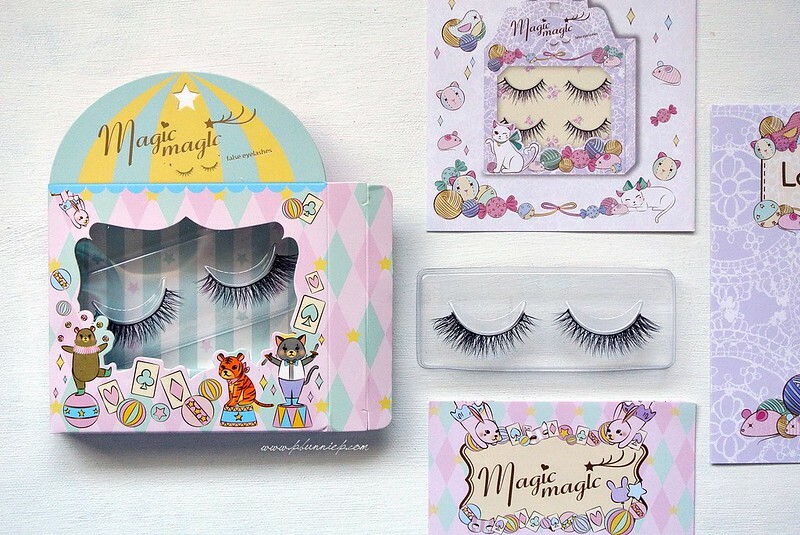 The packaging looks amazing and so do the eyelashes! Great review! They look quite enticing! So pretty and natural!